Crowned Hampshire Open 2013 champion. After no points at the Dutch Open, Scottish Open losing in round for the points at both. The Isle of Man Open a couple weeks ago saw me needing to score ranking points to get back on track. I had 8 of 12 ranking scores needed with 6 months to fill them. So there is no panic setting in just yet. You do tend to check your draw to see if there is anyone in it to worry about. I had Jonny Clayton the Welsh international who if we got to each other would be the round for the points. It happened that way and I was right to fear the outcome. Jonny flew out the traps and missed 5 darts at a double with me sneaking it. It turned the match on its head, as next leg went to me with the darts so at 2-0 down. In the sprint format we play its a killer to your confidence. Another missed dart to save the match and I hit 40 1st dart to win 3-0. Jonny the nice guy he is chalked for me as it was winners chalk. Shows the good guy he is in defeat. Won Board final against Ricky from Cumbria and then the usual 1-2 hour wait while all boards finish. Last 32 saw me play Red Dragon team mate Martin Atkins. I set off fast winning 1st leg in 13, I then stole 2nd leg so at 2-0 I then hit nothing in the treble 20 region till it was too late every leg. Kept leaving a double and Martin kept shooting whatever he had left. Disappointed but 14 Points and box no. 9 filled. 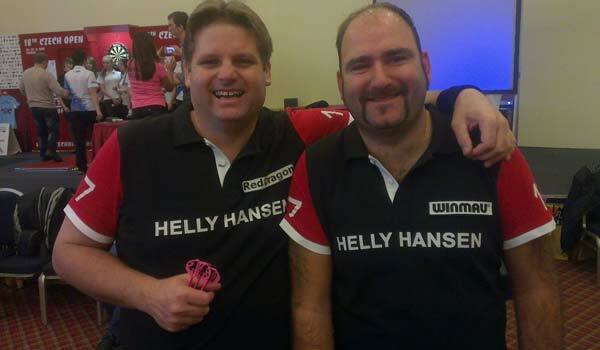 The pairs saw Richie George and I progress to last 16 where we met Winmau duo of Darryl Fitton and Andy Fordham. Best of 3 is even more cut throat and at 1-1 Dazzler throws a dart and it falls from the board. On his return to the oche Andy says "the size of you I can't believe you throw like a girl" then as I was about to throw he said "at least you don't dress like one". Everyone watching is laughing, I can't throw cause I'm laughing. Everyone watching was laughing. We lost match in the end but Andy showed he is getting there with his game. It's good to have him and his fun back around BDO again. He will as always be popular wherever he goes. He has new sponsorship from Dutch company Mariflex to join Mariflex Dart Team. Singles was won by Stephen Bunting and the Pairs won by Glen Durrant and Tony Eccles. The Mariflex Open in Rotterdam was last weekend and has added bonus of the Dutch Dart Guys against the English Darts Guys. This takes place on the Friday afternoon at Sparta Rotterdam's training ground. It was on astro turf and that was good as it was snowing and wind chill of -5. Last year it was an 11 a side match. This year it was on a half pitch and 7 a side roll on roll off subs which for most was quite literally. 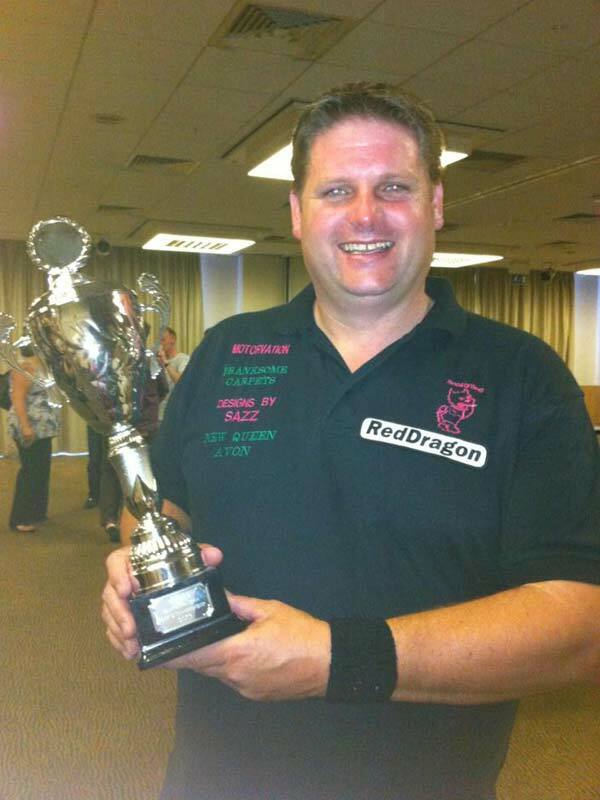 Irishman Paul Brown most will remember from Winmau World masters run last year was England's star man. It's a bit like England Cricket team being full of South Africans !!!!! Paul was a scorer for us but unfortunately was a bit rusty and missed a hat full. He did level the match at 2-2. It went to penalties. We know how bad England are at penalties and once again it proved to be the case. It had nothing to do with me being goalkeeper, but more how poor our penalties really were. Paul Brown tried the little sneak penalty dink which did not work !!!! So the Dutch team took the honors. The darts it was back to losing in the round for the points again for me. At 3-3 and sat on 32 after 12 I managed somehow with 3 darts to do all but hit the double. My opponent was on 40 and hit it 1st dart for a 13 dart against the darts winning leg. The pairs saw Richie and I lose out in the 3rd round and we played two guys who just hit everything and out classed us totally. Its back to county duties this weekend for Dorset and a home match against Gwent. Weekend after is Easter and I'm looking forward to being home with no darts for a weekend. Spend some time with family. Nice to have down time and recharge the batteries before I head to Fife to do battle for England, against the Welsh and the Scottish in the Home internationals weekend. The British Internationals can been seen live on 5th - 7th April. Everyone arrives at Lakeside on Friday 4th January. We have a players meeting the night before the tournament starts at 7pm. Making sure we are aware of certain rules and timings of where we need to be and when. The new players earlier in the day who have not played at Lakeside before, had a tour of the Lakeside complex to let them know where everything is. As the meeting started we were told the brilliant news of the new three year deal with the BBC. As we approached Lakeside 2013 it had big issues for the players. Although you don't generally take a lot of notice of certain websites when they say there is no TV deal for BDO, you do start to believe them. We head back to the bar in the International Hotel and open our packs and have a read through what we been given and heading to bed. IMG who do production of Lakeside and had asked if I was Willing and able to do the TV pundit work. Saturday and it's up for breakfast. Some are up early as they head off for interviews for recorded segments used on either BBC or ESPN. I always head over to the stage and be part of the lighting check. Your able to go up on stage and have a throw. It's to check no lights are in your eye line or shadow on the board. I felt the throw was long and there was a problem on the oche wobbling. They sorted that out. I stayed as long as I could and then the time is up and we have to come off the board. Some players don't go but as one of the taller players I've found myself going as part of my preparation to settle my mind that things are right. All players are different. I head back to change as players for the 1st session are arriving to start their preparation. The matches start and I've learned you try to not to take too much in from these matches. If you get too attached to how your mates are doing, you can forget why you're there. A stint with Ray Stubbs on ESPN on the balcony as the guest pundit and that was Saturday done. Early bed and watching football highlights. Sunday was my day to play and I was up and for breakfast fairly early and back to the room by 9:30am. I went to players practice area and had a throw for half hour and then a diet coke and flick through a paper that was on a table. Few were in there, Darryl, Tony and Robbo plus others and practiced on and off til about 11. Headed back to room to shower and change to be in venue for 11:45/12 noon. We have to be at the venue one hour before the 1st match of the session which was 1pm. Parade of players in the afternoon session takes place at 12:30pm. I was not to play till 4pm and the last game of the afternoon session. So had a bit of time to kill. Having been there 3 years previous and lost, then for the game to be on BBC 2 live adds its own tension. Then add that my opponent Mark Barelli who is a friend, in exactly the same position made the game a very different one for both of us. The match soon arrived. I was out 1st. I had changed alot of things since my last walk out there. I'd toned-down my shirt to a black based shirt, worn my black shoes and ditched the pink ones and not walked out with my trade mark invisible dog on a lead. Would it work !!!! I flew out of the traps playing fantastic for 5 legs playing like Phil Taylor, then middle of the match played like Dennis Taylor. I'd lost my rhythm and had to change my pace to try find it again. So then staring a loss in the face, I reel off 4 legs on the trot like the Scott Mitchell my friends all know to win 3-2 in sets. Out came the tears, just same as my 1st wins for Dorset and England. Absolutely made up. Look to my wife Sharon and kids and they are crying. Looked at my sponsors and friends in crowd and they jumping up and down. It was an amazing feeling. They all know the time and effort I put in and are pleased that I'd finally achieved my target of winning at Lakeside. My old pub football team had all reunited at the pub we used to play for to watch the match. The whole pub in tears too apparently. I really felt for Mark but it had been a friendly game in my eyes. Mark and I had made each other giggle a couple of times during the game. At 2-2 in sets he had said at the table "mines not water, its neat Vodka so dont mix 'em up". I tapped him on the cheek and said "you silly arse". So when I go on my facebook to see a player who on the circuit with us had felt I was cheating Mark out of the match, I was totally gobsmacked. Thanks to those who went on there and stuck up for me. I believe the post was removed shortly after. These posts hurt still hurts closest to you, it is just part of the game now where social media is involved. Well my next game was Tuesday evening. Just when you feel the monkeys off your back I get a Kong jump on it. I was to play Robbie Green in last 16. The preparation was different for an evening game. It was early one but match was not to be televised live. It was a 5:15pm match. Difficult for me as that's the time I take my diabetic medication. I have to take it with food as I get stomach cramps. I decided not to take it until after the match. Big wrong move. As the match started it's stress starts to build up the few minutes before you go out adrenalin and nerves start to take over. This effects the sugar levels in your body and I felt very flat by time Robbie had won 2nd set and not totally in control. The alcohol I'd drunk by now was turning into sugar as well sending my levels up and up. By the end of set 3 I was heading to the water more as my mouth had gone like a dessert. That started to straighten things out a little and I was in more control and won 4th set 3 legs to 2. But at start of set 5 I was having trouble again. I'd shot 130 to take 1st leg and the dizzy spells got longer. I don't remember the last 4 legs until I'd watched it back on the highlights. I remember leaving the stage and the next thing I remember was I was in the toilets in the players room making myself ill to empty my stomach to stop levels rising anymore. I was taken to the hotel by my family where I took my medication, I relaxed and recovered my levels had dropped considerably. By 10:30pm I was hungry and returned to players bar to get a sandwich. Bit pale but more or less back to normal. I felt I was at a disadvantage cause because we were not on TV we had no breaks. I could have sorted it with a break in the match like all other matches had. I hope the BDO look into that. Cause we all should be given the same chance. There were many rumors going around and players had said things about me. What I'd done and where I went wrong. Pretty hurtful stuff but unless and you are a diabetic or are close to one, it's difficult to understand. It's only happened to me like this once before and that was a year ago and how I found out I was diabetic. I was interviewed by local Radio Solent on Julian Clegg morning show at 9am to explain what had happened to me. Ray Stubbs on ESPN on the Wednesday evening touched on what happened to me while I was guest presenter. I thank ESPN and Ray for that too. Well when I'd been knocked out the job description changed. Guest presenter on ESPN with Ray Stubbs and Nat Coombs. Both absolutely love their darts. Do their homework about it. Just fantastic to work with. I'd keep my eye on games while they were adjusting scripts to make them up to date as the games were going on. I'd mention where I'd felt matches had turned and why. I really enjoyed it and have to say still felt a big part of the tournament being part of the team of people that bought and try to enhance our beloved game into viewers homes. I owe a big thanks to ESPN and production company IMG, Simon Wheeler and Nairn for giving me the chance to be a guest pundit. The encouragement I got from Nat and Ray and thank them as they treated me as an equal in their TV world. The BBC guys Colin Murray and Rob Walker giving advice and encouragement as they liked how I was coming across. It just turned the Lakeside experience into a great week for me. I'd just like to extend congratulations to Scott Waites former team mate here at Red Dragon and Anastasia Dobromyslova on being crowned World Champions. I'd also like to thank my sponsors Red Dragon, Motor-Vation, Branksome Carpets, Designs By Sazz and New Queen public house for giving me the opportunity to get the Lakeside experience for myself, family and friends at home once again. Well Christmas, New Year and taking down the decorations out of the way means only one thing. Lakside World Championships is just a few days away. Sorting out the silly things like have I enough hair gel and plenty of my Red Dragon spares and supplies (spare Darts). I don't want to have a Justin Pipe moment. Are us dart players superstitious? I'm not sure but to be safe I've packed my lucky pants, lucky socks and this year for the 1st time, taken down the Christmas lights on the side of the house. Bad luck to leave them up they tell me, but only three years too late !!!!!! I've changed my practice routine a little in what and how I do it. I've stepped it up a little more for the last few days before we head down to our Mecca, Bob Potters Lakeside Country Club at Frimley Green. Zuiderduin Masters was played last weekend in Egmond on Sea 45 mins north of Amsterdam. It is reguarded as one of our majors in the BDO calendar. Pool groups of 3 are made up with winner of pool going through to last 8 and knockout stages. My 1st problem was getting there. Overnight on Thursday heavy snow hit Amsterdam and in particular Schipol Airport where most of us due to land. On arrival in Southampton Airport I immediately find a delay. Due to fly at 6:45am the board was saying no info till 7:30am was a worry. Facebook was saying all flights into Amsterdam cancelled. Stephen Bunting was trying to get a lift on facebook to Holland as his flight cancelled. Joe Davis Sussex youth player in the youth event had same trouble and Steve Douglas was stuck on a broken down play on the Euro tunnel. Deta Hedman was sat on a runway at Luton and had been for 1 hr and been told they would be for at least 1 more hour. Mine was still not cancelled I had decided to stay and see if the flight would go. Times of information on flight were put back and put back till eventually at about 10am we were speedily called to the gate to get on the plane. We sat on that for another 30 mins waiting to take off. When we got the other end on a bumpy landing through snow cloud we had to wait for a spot on the standing to get off about the same amount of time. we sat and watched 30 snow moving machines pass our plane trying to re open all 7 runways to return Schipol Airport to fully functional. The other delayed players were having success in arriving too except world no 1 Stephen Bunting who had got lift from Liverpool to Holland and had set off at 11am by car. Friday evening the tournament started. As the seed in my group I did not have to play till Saturday afternoon. With having 2 players who had never played on tv before I decided to go watch their match from the crowd. I'd expected to see Michel beat Bryan in the all dutch clash but the younger man Bryan de Hoog won 5-0. That immediatly opened up an can of worms in our group. My match with Michel van der Hoorst was made a bigger match immediately on Saturday afternoon. Michel found some form but a few costly missed doubles saw me lose 5-3. Bryan now well in driving seat needing just 2 legs to progress to the last 8. I felt if I won match and got ranking points, that was a result from the situation I'd put myself in. I don't know what I worried about as I took a rather rapid 4-0 lead. I then started to think that the winning post was near and lost next leg, but started with a 180 in the last and bought home the match 5-1. I'd won Pool F. There were surprises in other groups. Dutchman Rick Hofstra came through pool B beating Lakeside Qualifiers James Wilson and Benito van de Pas. Pool C saw young Dutch starlett Jeffrey de Graaf beating Richie George and former Lakeside semi-finalist Jan Dekker to top spot. Tony O'Shea had won through pool of death beating both Robbie Green and Darryl Fitton in pool E. Remco van Eijden on his return to tv stage having played at Lakeside few years back won his group beating Wesley Harms and World Champion Christian Kist for pool G. Stephen Buntng came through tough group full of Lakesiders Martin Adams and Geert de Vos with Adams poor run of form continuing losing both his group matches. My group win saw me matched up against Tony O'Shea. Tony been runner up in the last 2 majors, Lakeside World Championships last January and Winmau World Masters in October. We were the 3rd quarter final. You go into these matches just hoping to play well. If had a dream start winning the 1st leg with a 156 shot out. That was followed by a 180 start to the next leg. I won set 1 3 legs to 1. At 2-2 in second set I had an awful leg and Tony levelled the match 1 set all. The next was a 2-2 in legs again and with Tony left with under 100 I shot out 120 to take 3rd set. The 4th set at 1-1 in legs I broke O'Shea's throw. Tony sat on 40 I shot out 121 in a way that Bobby George taught me. 14, treble 19, bull. That put me in the driving seat. I missed 83 to win the match. Tony then unusually missed 64 and I shot 16 for the match and my biggest Tv win and into semi-final.Not a lot of time enjoy as in 1.5 hours would go through it all again. Not a lot of time enjoy as in 1.5 hours would go through it all again. In 1st quarter final Alan Norris and Rick Hofstra played a 180 fest match with Alan comng out on top. Quarter Final no 2 saw Ross Montgomery's experience saw him through against young Dutchman Jeffrey de Graaf. Quarter no 4 saw Stephen Bunting beat Remco van Eijden. The 1st semi-final went to Norris producing some of his best darts he had played on Tv. Except when he had missed 24 for 9 darter at Lakeside !!!!!! 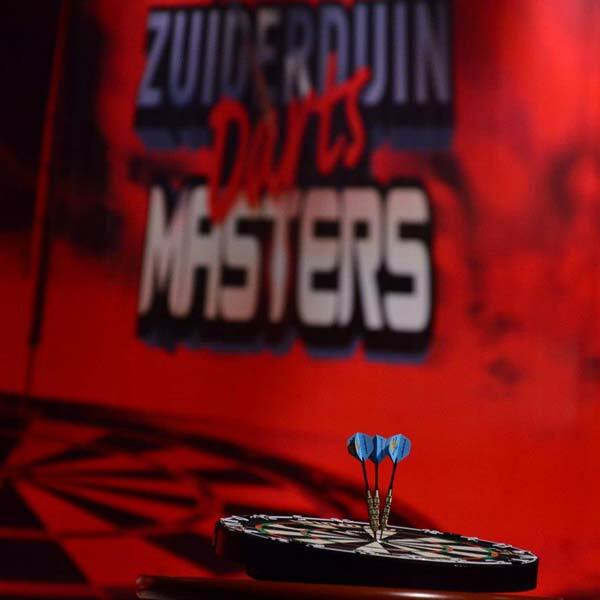 He had beaten Ross Montgomery a past champion of the Zuiderduin masters to a spot in the final. Semi-final 2 saw me matched up against World No 1 and our last major winner Stephen Bunting. I was confident as I'd beaten Stephen 3 weeks before in Northern Ireland Open although over a far shorter format. I'd not started the match well with 2 darts at 40 on the wire, a missed dart at the bull and 2 missed at 36 I lost set 3-0 in legs. The second Stephen had the darts and I finally won my 1st leg of the match in 3rd leg of the set but lost the set 3 legs to 1. At this point Stephen was running a 100 av and hanging on to his shirt tails was all I could do. I won 1st leg of 3rd set which helped and got to 2-1 in legs and felt Stephen was going off his game a little. He levelled at 2-2 after another missed dart at the bull. I had the darts got to double 1st. Missed 60 shot and with Bunting sat on 32 expected the worst. But he missed and I shot double 5 in 2 darts to take the game on. With Stephen having darts in 4th set was not going to make a mistake again. With me 2-1 down in legs and Stephen sat on 16 he took the match. I'd played against guy on top of his form and come up slightly short but was well happy to finally show the game I've got on tv. 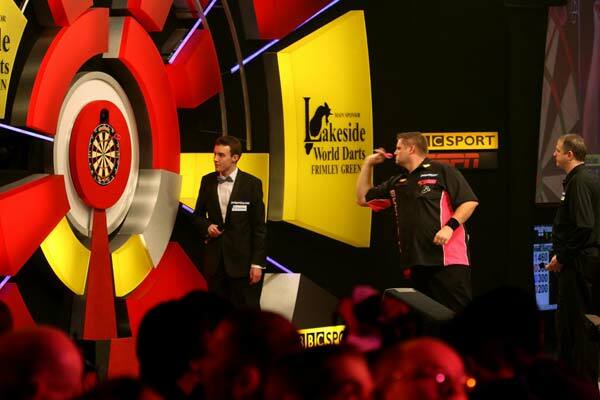 More ranking points for Lakeside 2014 and head into Lakeside sat ranked 4\5 in BDO World rankings. The ladies event was won by Anastasia Dobromyslova from Holland's Aileen de Graaf. The youth event was won by Quinn Wester another top young player to come off Dutch youth conveyor belt. He beat Belgian Kenny Neyens. On way home we had more travel problems with our taxi ride of 40 mins taking an hour and twenty minutes, leaving us belting through the airport to make the flight. Yep we had delay of 40 mins when we got there too. It was Prague and the Czech Republic's turn to host the BDO circuit last weekend. I travelled with Dorset County Captain Mark Porter and Gary Stafford of Hampshire. We met with Richie George at Stanstead evenually when he arrived. Our 5am meet up turned out to be 6am and an hour late. Rather fustrating when you can't check in for an hour as I was to take his darts in my bag in the hold to save the boy wonder a fiver !!!!!!! The singles was played on the Saturday and with this being a Category C under new ranking criteria points down to last 32 so that's your aim when play gets underway. Good turn out for the men's singles in 410 entrants. Notable seeds who never got to the points were Willy Van Der Wiel losing to Mark Salmon, Steve Douglas lost out to Brian Bird, and Wesley Harms whose loss biggest shock of group stages to Surrey's David Webb. I came through group 29 without losing a leg. My next match was against Benito van de Pas. At 1-1 in legs Benito missed 3 darts at 32 and I took my 56 to go 2-1 up. Held my leg in 15 darts to go 3-1 up. That was last chance at a double I would get. Two good legs from Benito saw match level at 3-3 and losing the bull up and a 140 to start leg 7 saw the match get away from me losing 4-3. So 10 points for my ranking total up to now. Six ranking tournaments down and 6 lots of ranking points gained is very pleasing. To me it means I'm showing a good form at right time of the season. Dorset team mate Mark Porter won his group 15 and got to last 16. Gary Stafford had lost out in group final and Richie George had won his group and lost out to Darryl Fitton 4-2. Darryl enjoying a turn in recent form took Scott Waites all the way to 7th leg missing 2 darts at Double 16 in last 16 to win the match. Waites Continued to ride his luck with Gary Robson also missing 2 darts at Double 16 to take him out in last leg decider. We were down to semi finals Martin Atkins v James Wilson and Scott Waites v Alan Norris. Atkins was superb in 1st semi final beating the in form James Wilson 5-0. Scott and Alan contested a fantastic semi-final which Scott won narrowly 5-4. Norris missing match darts against Scott in last leg to take the match. Both men throwing a 105 average. So that left two Yorkshire man Atkins and Waites to contest the final. Unfortunately for Atkins he was unable to turn over an unstoppable Waites win 6-1. Scott threw another 100+ av but this time only 103 !!!!!! It was a title won back for Waites who won it previously 2010 where he did the double that year winning the Pairs title with me. Saturday a few of us head out for something to eat and then some onto the city. On the way back in I'd decided the poster on the advertising board for the singles needed correcting. As we saw from the Grand Slam Scotty Too Hotty has been supporting Movember with a Mexican type tash. So with a marker pen from reception I duly obliged. Sunday morning and it is the pairs day and as last couple of years I was partnering Mr Too Hotty. We were seeded no 5 but I think was fair as Mr Waites is struggling in the BDO rankings at this early stage meaning I am highest ranked Scott in the BDO world right now. (a little fun thing we have going between us). Team Shirts are something Scott Waites in pairs does not do. We had planned for me to wear a Too Hotty shirt and him to wear a Scotty Dog shirt but certain logistics, mainly body sizes meant that was impossible. So we agreed a casual type shirt to wear that were the same would be acceptable. We played great in these shirts and soon found ourselves in the last 8. We had done 11 dart and 12-15 dart legs consistantly to reach this point. Beating fellow Lakesiders Clive Bardon and Steve Douglas in last 16. We were to play new team mate at Red Dragon Wesley Harms and Jeffrey De Graaf. We were looking good at 3-1 up and a missed dart at Bull for 167 for me and a missed chance to shoot out 80 for Waites saw us pegged back to 3-3. Wesley winning the bull and we never saw them for smoke. They were great in last leg to win 4-3. They were eventually beaten to the title by Gary Robson and James Wilson. I must just add before I close this report, I am personally so chuffed for fellow tractor driving country lass Rachel Brooks of Yorkshire. She beat Deta Hedman in the final of the Ladies singles. That is no mean feat in itself. She was so shocked and just could not believe that she had won a title. Well done Rachel and I'm not a fellow Yorkshire person but just so pleased to have seen you win one. 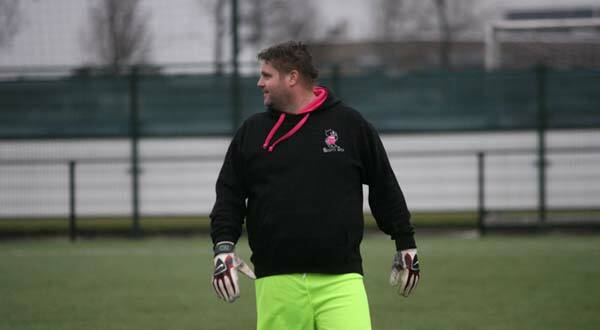 Big thanks to Jiri Pauzer for all his help to us British players over the weekend. Jersey Open was from Wednesday 14th to Saturday 17th November. Lots of talk about this one as the finals on the Saturday ran over on to Cat A Sunparks on the same weekend in Belgium. Flew out from Southampton with Sam Head, Gary Stafford and my Wife Sharon. When Sharon and I got married 21 years ago she wanted to go to Jersey on Honeymoon. But unfortunately the Weymouth Beach motocross event fell in the weekend after wedding in 1991. I was racing in the biggest event of our season, we never ended up going to Jersey. If I remember Peter Vroom actor who played Lance in Home and Away was the celebrity starter of my race that day. Anyhow Sharon was coming to Jersey Open probably 21 years late !!! The 1st event was a double in double out best of 5 501 non ranking singles event. I got through a couple of rounds without dropping a leg. So in last 16 played Glen Durrant. Three attempts at the bull which Glen won was deciding point of the game. At 2-2 and both hitting doubles 1st dart to get in Glen shot out in 14 with me sat on a not to shabby 120 after 12. Jimmy Hendricks was eventual winner beating Tony Eccles in the final. Thursday during the day was mens pairs. I played with Dorset County player Graham Platt but double trouble saw us loose in last 16. Winmau's Darryl Fitton and Mike Waterworth beat Hampshire's Sam Head and Tony Martin in the Final to take the title. In the evening was the Darts Corner Jersey Mens Open and was ranked Cat B. The last 8 would progress through to finals day on Saturday. I managed that feat but had to come from 2-1 against Jersey entrant Steve Eusebini and in 6th a 14 dart leg to win it 4-2. Friday during day was mixed pairs. As usual my partner was Sue Gulliver. We had tough little run but won 1st 2 matches. Second match beating Sam Head and Fallon Sherock 3-0. We then played Deta Hedman and Glen Durrant. They flew out of blocks to take a 2-0 lead but missed doubles meant we got back to 2-1. 2 darts at double top missed by myself saw Deta and Glen take match 3-1. The evening saw Target Jersey classic mens. Got through my 1st couple of matches against Ryan Carver and Chris Smith and found myself in the last 16 v Darryl Fitton. I lost to Darryl 4-2 which I can only describe as one of those scrappy matches where both had opportunities to win legs and didn't. I did not deserve anything from that match and I would still be there now trying to hit a double. Just one of those matches. On Saturday finals day I had Darryl again in the quarter finals of the of Darts Corner Jersey Open. Totally different match than the night before as 91 av for me and 90 for Darryl. I had chance to break in leg 3 missing 3 darts at tops and 10s and then 2 darts at double 16 to hold last and lost 4-2. An earlier end to the weekend than I'd hoped for but themselves the breaks. Another 30 points to my ranking tally and overnight on thursday I was sat at joint no.1 in BDO rankings with Darryl Fitton which is another 1st for me. But by Friday and a loss to Darryl saw me fall off top spot. 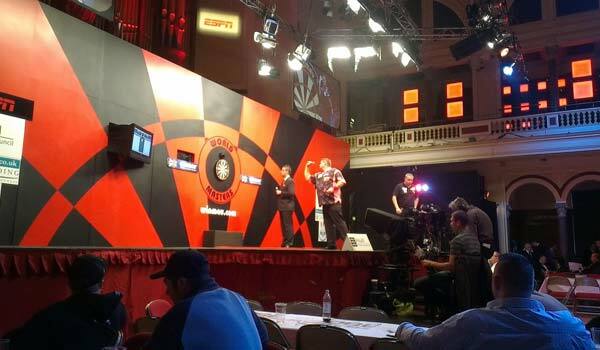 Although poorly attended through no fault of Jersey Darts, the organisers or Hotel. This was a really good tournament to have been resurrected. I hope there will be another next year. Next stop Prague and the Czech open 23/24/25 November. It was Northern Ireland Open 9/10/11th Nov held at Bellini's in Newry was the venue for the BDO tour. Few were flying BDO flag in the Grand Slam in Wolverhampton and still are. Not attended this one for a couple of years as it clashed with the Czech Open. Travel mates for this one were Hampshire's Gary Stafford and Sam Head. The thing I like about this open is I can fly from Bournemouth International Airport which is just 5 minutes away. Landed in Dublin where we met up with Richie George my Red Dragon Team mate. Drove hire car north to Newry to our Hotel. While we were in bed Deta Hedman and Robbie Green were taking the mixed pairs title. Next morning was the singles I'd had a tough looking group I felt with Geoff Wylie, Mark Salmon and Winmau World Masters champ Stephen Bunting in my group. I played well in 1st 2 matches winning 3-0, 3-0 taking me into semi-final of my group and a match with Stephen Bunting. After 2 attempts and my 2nd being a bull I won bull up to start. The match went down to the wire. After 15 darts and level at 2-2 I had missed 1 dart at 40 to win match. The Bullet with 156 on the board wired 36 to take the match. With 3 darts to win I missed. So then 3 darts for Stephen and he missed. 1st dart I hit double 10 to take match 3-2. The second semi-final in the group saw Mark Salmon of Wales play Geoff Wylie of Northern Ireland with Salmon coming out on top. So final of group started with Salmon beating me on the bull up. 1st leg Salmon missed a dart at 40 to win. I shot out 84 on the Bull to steal the leg and the darts. Won leg 2 to go 2 up. Mark held throw for leg 3 and leg 4 saw a 180 put me in command to win match 3-1. That put me in the last 32. I waited for one hour and a half for my next match. I have no idea of the Irish mans name but know he beat Darryl Fitton 1st round so it was gonna be tough. At 2-2 and with darts 140, 100, 140, 89 I faced 32 for the match. Missed 3 darts and my opponent hit 140 to leave 56 and I missed 3 again at double 8 and the 56 was shot out and I'd lost the match. Disappointing as had I won the match I would have got to play Daryl Gurney who had turned me over last three times by the odd leg. Daryl's inclusion in the draw was contriversial in itself as having qualified for the Ladbrokes World Champs at Ally Pally. Daryl went on to win the Northern Ireland Open singles beating Willy Van Der Wiel in the final. Ladies was won by Deta HedMan beating England youngster Fallon Sherock in the final. Mens pairs was retained by Red Dragon team mate Ross Montgomery and Robbie Green. Ladies pairs was won by Deta Hedman crowned champion for the 3rd time on the weekend with Rachel Brookes beating Fallon to her 3rd runner up spot over the duration of the weekend. We flew home over our house to land back in Bournemouth Airport. Sharon had seen the plane fly over and got the car out to come pick us up. Next stop Jersey open on Wednesday and may get to Sunparks in Belgium on Sunday depending on how events unfold in Jersey. The draw for Dutch Tv Tournament the Zuiderduin Masters played on Weekend Dec 7th-9th. I've got group with Dutch lads Brian De Hoog and Michel van der Horst. Pick of the groups Darryl Fitton, Tony O'Shea and Robbie Green. This year for the 1st time the 9 Dart leg has a sponsor and they have put up a Hyundai Veloster car if the feat is achieved. Friday 19th October we headed for Belgium and the Top of Ghent in Belgium. Why mention the date? It was my 21st wedding anniversary. No better way to celebrate it than being picked up from home at 8:30am. I'm a very lucky fella to have such a supportive family and I think this shows how much not just me, but WE dedicate to being on the circuit. I was collected by Dorset county captain Mark Porter and headed to the services to collect Hampshire duo Gary Stafford and circuit new boy Sam Head. Sam you may have seen on ESPN at the Winmau World Masters. He lost out in last 16 to Red Dragon teammate Phil Nixon. We headed to the Tunnel and met up with Richie George. Gary jumped in with Richie so he was not driving on his own and headed to Ghent. Gary and Sam were booked in same hotel as us but when we got there, although with proof of booking and reference numbers for them the hotel was full. So a sister hotel had spare room at centre of town, which happened to be better than ours !!!!! Saturday was the singles. Good start for Dorset pal Mark Porter beating John Boy Walton 1st round 4-2. I made my group final to play Max Hopp. Max is from Germany and 16 year old. Keep you eye out for this lad. He is a fantastic talent. More known for his PDC youth and European tour events. 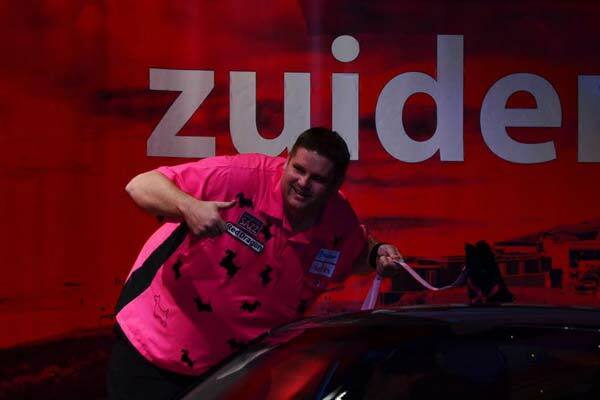 He plays Terry Jenkins this coming weekend in a PDC tour event in Holland 1st round. Max at 3-3 had 3 darts to take me out leaving me to shoot out 96 in 2 darts to take the match. That put me into last 32. I then played Belgian Marx Vic. He had beat my Dorset mate Mark in the group final on the board next to me. I beat Marx 4-3 in another last leg decider to make the last 16. My next opponent was another Belgian Geoffrey Marreel. This one I won 4-2 setting me up for a last 8 clash with Scotty Too Hotty Waites in best of 9 match. A 104 shot to take 3rd leg after Waites had missed 2 at double 16, gave me a 3-0 advantage. The next leg went against throw to Waites. Leg 5 I was left on 48 after a 180 score to get there. Waites shot 128 - 54, 54 double 10 to go 3-2. With Waites on throw I scored 140, 140, 100 and 97 to leave 24 Waites again shot 109 in 15 darts to level match at 3-3. A double 16 saw me take next leg to go 4-3 up. Waites did another 17 dart leg with me sat handy on 56 to go 4-4. I had the throw and started with 180. I got down 1st and I missed 96 leaving 9. Waites had 1 dart at tops he missed and I missed double 4 and double 2 after hitting the perfect single one to leave it. Waites shot 20 1st dart. Disappointed well hell yeah but happy as I'd bought the very best out in Mr Too Hotty. Good points for me early in the season so was pleased with that. Waites went on to beat Stephen Bunting in the final to take the Top of Ghent Men's title. Gary Stafford had got his 1st points of new season losing in last 32 to Gary Robson. Ladies title was taken by Irina Armstrong and Trina Gulliver was runner up. Fallon Sherrock had a great run getting to the semi-final. Sue Gulliver had played well to make last 8 and Suzanne Smith made last 16 was a result after the drama she had to deal with the day before. She had driven over Fallon and Jake Jones. Unfortunately at the ferry terminal on the way over, Suzanne's car was T-boned turning into her boarding lane by a Frenchman. So had done well to get herself and passengers to Ghent to play at all. Sunday was Mixed pairs in the morning. I was partnering Sue Gulliver. She had carried on her form from day before and we were soon in the semi-final. We played Sam Head and Fallon Sherrock. They set off like a train and won 1st leg easily but the next 4 we had done some heavy scoring to win match 4-1. Great to see them both in a semi-final. The final was on stage so it was on to the men's pairs. I was playing with Peter Mitchell of Kent for the 1st time. Now are not related. But we were soon being called Grant and Phil. We clicked immediately and soon found ourselves in the quarter finals where we won 4-3 from 3-1 down. We then did the same won our semi-final 4-3 from 3-2 down with our opponents missing 2 darts at 40 to take us out. I shot 71 with double top on last dart. So 2 stage finals for me. In the mixed pairs we were to play Martin Atkins and Paula Jacklin of Linconshire. We raced into a 3-1 lead on best of 9 match. I missed 3 darts at 40 in 5th leg and lost it and 3 darts at 32 next leg and we lost that too. So at 3-3 and lots of confidence from the comeback Atkins and Jacklin took the match to become champions. Runner up I was very disappointed with as we could have won it 5-1. In final of the Men's pairs we were to play Belgians Geert de Vos and Stefaan Duprez. They had beaten Scott Waites and Stephen Bunting in the quarter final 4-3 and Robbie Green and Dutchman Bryan De Hoog 4-3 in the semi. We won the bull and I started with a 180 and we lost the leg. The next we scraped but it gave us momentum and soon found ourselves 3-1 up. The next leg with our throw a 140 followed by 180 from Peter saw us sat on 100 which I shot in 2 darts for a 4-1 lead and 19 dart 701 leg. De Vos started with throw 180 to show they were going nowhere without a fight. I followed his 180 with one of my own. Peter followed with 140. My next throw was 41 but Peter followed with 140. I hit another 140 to leave Peter 100 which he shot in 2 darts as I had done previous leg but this had been an amazing 17 dart 701 with 41 score in the middle. So we were Top of Ghent Men's pairs Champions. Trina Gulliver and Zoe Jones had been crowned Ladies Champions beating Sue Gulliver and Paula Jacklin in the final. With 2 finals and missed Euro tunnel train we headed back hoping to make the last train at 10:30pm. We arrived at the barriers and Passport control being told we would have to wait till the 1:47am train home. We headed for the terminal thinking how we would kill that much time. As we walked in the terminal one of the assistants came over and said if we could get to the train in 2 mins there was room for us to catch it. The 4 of us ran out the terminal like we had just robbed the place. Jumped in the car and drove like the wind and got there very happy and relieved. But as we left the terminal car park we passed Clive Barden, Emma Little, Steve Douglas and Peter Mitchell in their car going into the terminal knowing they had 3 hours to kill and we had got away with it !!!!!!!!! My blog for this week. Busy time before the Winmau World Masters for me. End of year work schedule of hedge cutting, lawn care and sorting through borders splitting plants, pruning of the dead bits between terrible days weather wise. The weekends had been busy too, taking my kids to Wolverhampton to play Youth Darts for Dorset. Then as most I was playing myself for Dorset at home to County Durham. I had won 4-0 with a 31.31 ave winning highest average in our venue netting me a £100 and I'm told it was the highest in division 1. So was Hull bound feeling fairly confident. It's the 1st time I've attended the Masters as a seed and on in the TV stages. I'd missed out on the tv stages a few times before getting beaten by Ross Montgomery 3-2 in sets although I'd won 7 legs to his 6 and a loss to Martin Atkins in latter stages too. Both now my Red Dragon team mates ironically. The Hull City Hall is a good venue for the tv stages. I like the place because its oldy worldly with plenty of character. I travelled up on the Thursday and got there in time to watch the latter stages of the Masters qualifier. There were some great matches being played to get through to TV stages to play on Friday. I'd had a call from IMG the week before asking if I would do some pundit work which I always love to do so are more than willing. I do make sure that I don't wish it in anyway to clash with any of my matches. Friday morning came and I looked at the draw on the BDO site trying to find the time of my match and who I was playing. I had somehow been missed off the draw with times up on the website as Steve Douglas v John Boy Walton were on there twice. One of the times was 2:30pm and the other was 6:00pm. So I knew I was one. I called tournament director and he apologised and told me it was 2:30pm I played against Andy Boulton. I had no problem with it as it was 9:30am so plenty of time to get in my routine to prepare for the match. I'd met up with Richie George for breakfast and we went back to his hotel for a throw to prepare us both. I headed back to my hotel to get ready about 12 noon and was at the venue by 12:30pm. Andy Boulton is a class act. I've known Andy and Alan Brown his father in law since I've been on the circuit. They were huge help at the start of my circuit days. One of the first guys to introduce himself and not leave me like Billy no mates in the corner. He is a consistent qualifier at these events doing it the hard way through the qualifiers. The game was not live but was filmed and did not get shown unfortunately for me but I'm sure Andy will be chuffed about that. I won bull up at 2nd attempt in the back room. With such a short set format it's something you need to do. I won 1st set because Andy missed doubles. I played some good darts but Andy was still there at 1-1 in legs 1st set. Andy missed doubles to take the set and I stole it. I'd won the second set the same way. So I'm 2 sets up feeling comfortable. Andy won the 3rd convincingly so at the start of the 4th with Andy to throw I felt we were heading all the way. I stole the 1st leg and won 2nd to win in sets 3-1. I was really happy to get the monkey off my back of not winning at TV tournaments. Pleasing was the fact the average was a snippet short of 30 and I'd won 6 legs with 11 darts at a double. I then headed off for a late lunch, change and shower back at the hotel to prepare for some TV pundit work with ESPN. Let me tell you about Ray Stubbs. He is an avid darts fan which means he asks all the right questions the viewers would like to know. He watches all the games on his monitor with sound between links so he does not miss the big action in the matches, or interesting information about the players that may come up in commentary. He can then use these in the post match interviews. He loves to see the new faces and giant killings that makes our side of the sport so unpredictable. Most think he is drinking coffee and eating Jaffa cakes to pass the time. Top man and so enjoyable to work alongside. I then get offered a slot in the commentary box which I jumped at. My 1st match was with John Rawlings on the Martin Adams v Rune David match. John and Richard Ashdown who was the spotter for the camera men, made me feel very calm and welcomed me into their world. Then I got to do Richie George's match against Thomas Junghans. That was very special as it was with the legend Tony Green. After the match he had told me how well he thought I'd done. I won't ever forget that. I did the last link of the live coverage at midnight with Ray and headed back a short walk to the hotel. It was about 12:45am before I was tucked up in bed. My match on Saturday was confirmed as 7:15pm against James Wilson. I was to have no TV commitments in the evening so I could concentrate. Arrived at 5pm so couple hours before my match. James Wilson and I are mates so we were practicing together for a bit and having a beer when at 5:15pm after half pint each we were told we may have to play at 6pm instead. Ross Montgomery was running late and they were worried that his 6pm match would not happen. This is disappointing that your preparation for our game was disturbed. James and I agreed we would not bull up for another 20 Min's or half hour. That would be 10 Min's before 6pm. Ross made it for his 6pm match so James and I then had another hour and a half till our match. We missed Lakeside draw as we were taking the long walk up to the balcony for our walk on. We were listening to it as we walked and I'd heard I'd drawn Mark Barilli of Scotland. In the Mock draw in the afternoon I'd drawn James Wilson !!!. I was supposed to be at my Nephew Andrews 4th birthday. I did a sign for him although he can't read it he was told what it said. Match started and I won 1st leg and James won 2nd and while I went 140, 140, 100 to leave 121, James had thrown 60, 180, 140 and left 121 also. I made hash of mine leaving 68 but James shot 121 for 12 dart leg, stole the darts and take 1st set. I'd played well again in 2nd set and at 1 leg each I missed 3 darts to take the set and went 2 sets down. Held my throw for 1st leg in 3rd set and then missed 11 darts to take the set. So at 1-1 I made a miscount and left myself 165. James back on 232 punished it by hitting 180. Me not able to get out on 165 I threw 133 to leave 32. After leaving myself 165 on a miss count. James had hit 52 game shot to win the match. I'd had 29 darts at a double which is not good enough. James in interview with Ray Stubbs had said how hard it was to beat me as his friend. I then after the match had to do some shots for Lakeside and was asked to do a serious mean face. That was fairly easy I have to say. I stayed and watched the last of the matches and headed back to the hotel to get my head down on what felt a very long day. Julie Gore had beaten Tamara Schur earlier in the day was the news of the day in ladies semi-final. Lakeside Women's World Championships line up would be taking one more from the ladies rankings being Trina Gulliver. This is because with both Men and Ladies, World Masters Champions get a spot in Lakeside. If the winner has already qualified the place goes down one more in the ranking table. Well happy for Trina in a tough year for her. Sunday I was doing some TV work but was still disappointed from my loss. We had to be out of hotel by 10am but they kindly let us leave our car in the car park all day free of charge. Thanks to the Royal Mecure Hotel for that. We went to subway for a breakfast sub. A lad came over and asked for my autograph. His name was Derek Park. He was from Malta but originally from Scotland and he travelled with his Mum and Dad. He had played in the youth masters. He had to leave his darts at home as they had not booked a bag in the hold forgetting they would need to carry the darts. I had asked what weight he used and although it was too late told him if he went to the venue, he could have a set of my 23gm darts. He was so happy to have been part of the masters. It was a breath of fresh air. I'd gone to this shopping place to go to the cinema to cheer me up so I was not looking all down hearted on TV. I did still go and see Madagascar 3 in 3D with wife Sharon and Daughter Katie, but I had not needed to. Young Derek had cheered me up no end and we met up back at city Hall and gave him my darts. So thanks mate. Back at the City Hall I did some links with Ray and Martin Adams was doing some too. I'd found out the make up lady had been touching Kylie Minogue two weeks before she was touching me with the same hand !!!! (she had washed it). Martin and I were popping up and down from balcony and commentary box. I did one quarter final and a 4 set spell in a semi-final. The second semi-final of the men's Saw Tony O'Shea beating Paul Brown of Northern Ireland. This meant as with the Ladies, the Men's Lakeside World Championships would also take an extra man from the Lakeside rankings in the form of my mate and Scotland's Gay Stone. Anyhow I thought I was done with commentary and just a few links left. A person had come up with a headset from the sound department on the balcony, producer had asked would I be happy to commentate on the sets 5-8 in the final. I have to say I was made up and so excited I said yeah no problem, but inside my heart was racing. I was at Stephen Buntings 1st ever county match as a 14 year old for Merseyside when Dorset played them in Liverpool. It was my 1st county match too. So to then be part of his 1st final is just one of those crazy stats darts keep on throwing out. Commentating on that section of the game was great. I was co calling the turning point in set 8 where Tony O'Shea missed 3 darts at 40 and 10s and Bunting hitting his double took a 5-3 lead in sets at the break Tony was never close again. Stephen winning 7 sets to 4 for his 1st TV title, another runner up birth for a guy who just seems for ever the bridesmaid Tony O'Shea. I did the last TV link to close show with Ray and Martin. I felt rather sad it had to all end. I said my thanks and goodbyes to all in sundry and got into the car at 10:45pm to drive home. Sharon and I had shared the driving and arrived home at around 3:45am in the morning. Up at 7:45am and headed off to work as usual. From Pop star on the TV as Bobby George would say, back to farmers kid in a few hours. It brings you back down to earth. What a great Winmau World Masters for me. Thanks to sponsors as always and my wife Sharon who was feeling torn in 2 as daughter Katie was with us, but son Sam was home as he was unable to travel with us. So really tough weekend for her too.